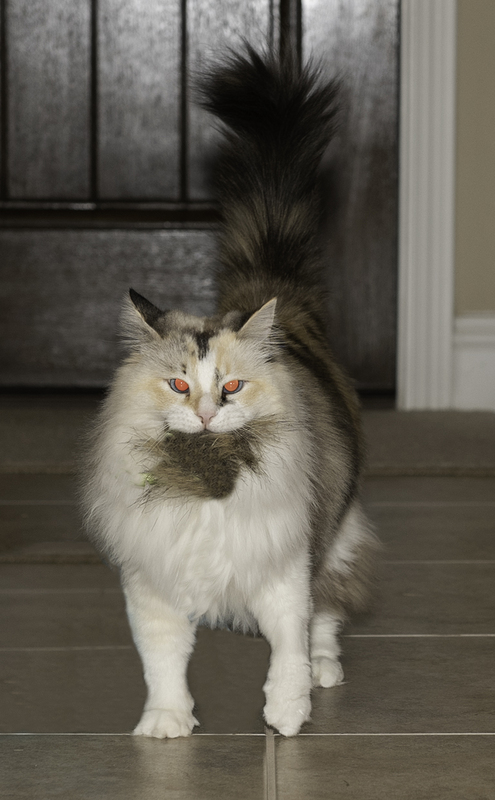 This is our cat who loves to drag her toy around to "share" with us.The original photo is after deleting part of toy she was dragging around behind her. This was taken with my Nikon 810 24-70mm lens at 70mm; f5.6@1/60; ISO 400. I used my flash to purposely get the red eyes; I used Topaz Glow to distort the cat. The background are out of focus Christmas lights. Fun to play with filters. I've yet to find something to use with Topaz Glow it but does fit here. Good idea to use the Christmas lights as a BG. The black spot in the front of her chest is apparently the toy you said was deleted, but it bothers me in that it deliberately draws my eye. The first thing that hits you is the red eye effect and I am glad you wanted to include that. Glow has made a good shot pleasing composition into a monster creation and it works. In the original, if I came across that cat I would want to make a fuss of it. In the one in the photo I certainly wouldn't want to come across it. Richard, your image really grabs my attention! I agree with Mike that the red eyes really "make" the image. And, I also agree with Barbara that the background is well chosen. You've created a spectacular cat! I have two minor suggestions. First, I would like to see all of the cat's feet. Having the foot on the left cut off keeps me from feeling that the cat is completely grounded. 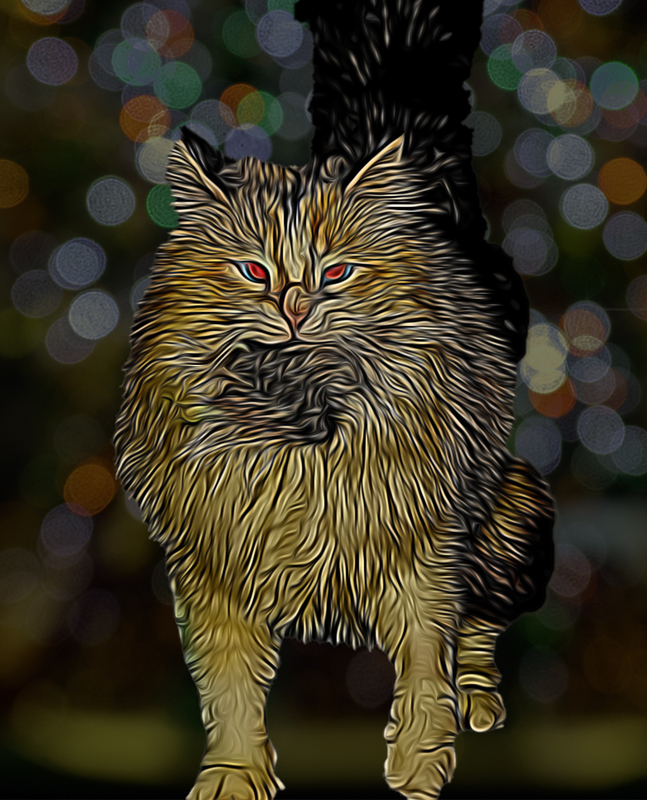 The second suggestion is to soften the black areas of the cat's tail and right hip. I would find it more appealing to have the sharp edges of black fading into the Christmas tree lights. An amazing transition from a "typical cat picture" into a memorable image of a cat monster.